Kids love their cardboard boxes but who knew you could craft something so incredible out of cardboard? 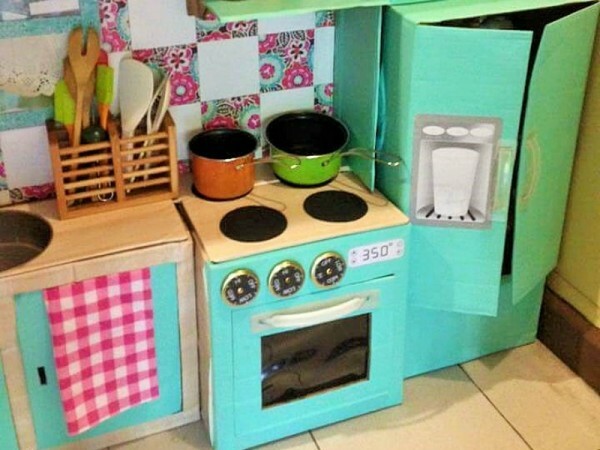 Come and see how one mum has transformed a pile of cardboard boxes into her little girl’s dream kitchen with only a few accessories, wall stickers, toys and a lick of paint. Attention crafty, clever and creative mums – here is one to pin to your board. It’s a cardboard box kitchen. And it’s spectacular. 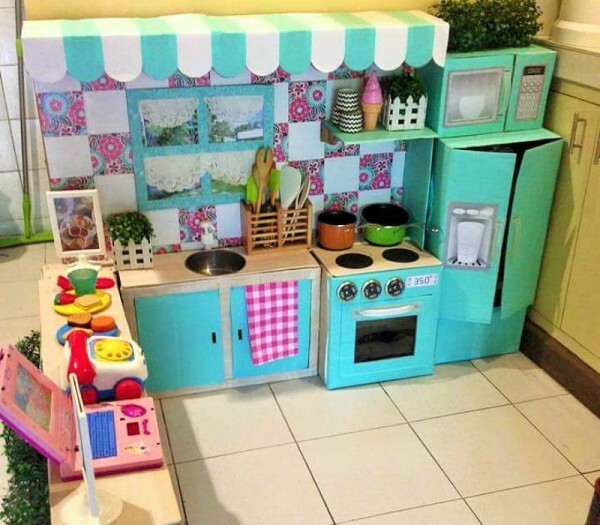 Designed by mum Rodessa Villanueva Reyes, the mini cafe features everything a toddler could ever want in a play kitchen including a sink, oven, refrigerator, microwave, computer and telephone. Rodessa created the kitchen for her one-year-old daughter and shared the image to her Facebook page last week. 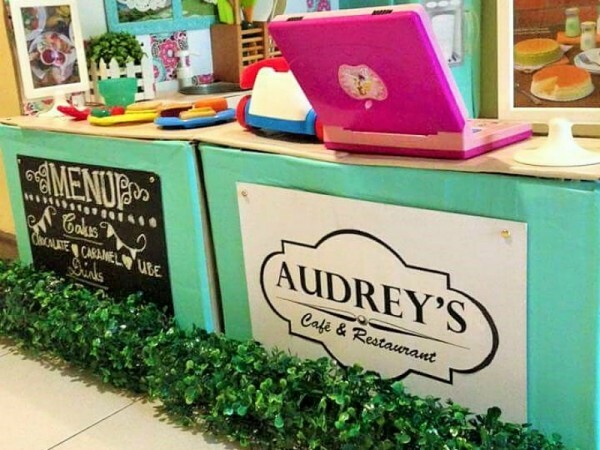 So just how did she transform a bunch of tired looking boxes into an urban cafe? She started by collecting boxes from local stores and then designing the kitchen. She cut lines for the doors, the ovens and the awning before covering the cardboard with vinyl stickers and white card and complementing the look with adorable printed stickers and a coat of turquoise paint. Everything apart from the play laptop, phone, fake food, plants and a few kitchen utensils is handmade. 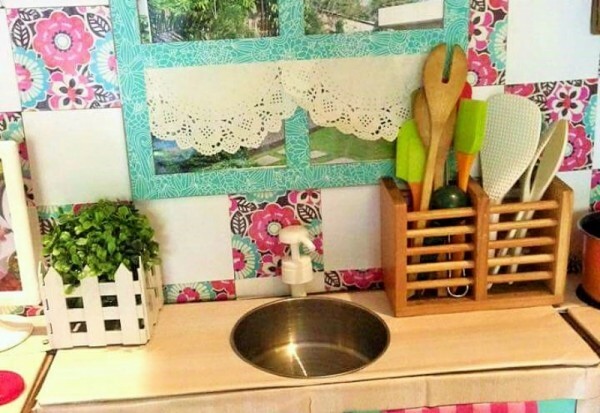 She crafts the oven range switches out of jar caps and used a cake pan to make the sink. The tap is made from an empty hand-soap bottle. We especially love the faux grass patch at the front of the cafe and the beautiful signs really complete the look. What little girl or boy could resist this play kitchen, made with love by one very talented mumma? 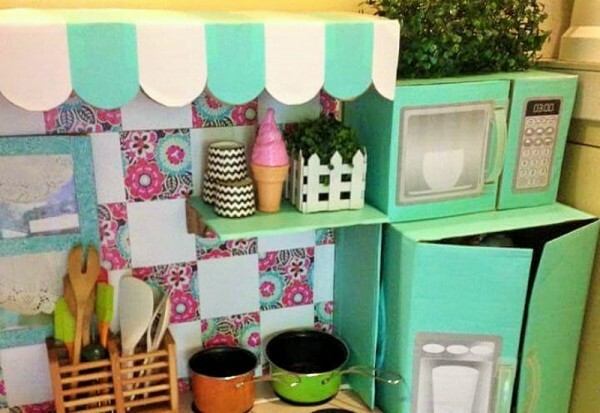 Check out some other kids furniture that is flat-out fun with our cardboard box creations round-up as well as this DIY cardboard cafe.